Risk-raising mutations, which occurred in children but not their parents, were found in both protein-coding and regulatory portions of the genome. UW Medicine researcher Tychele Turner studies family genomes to learn more about mutations associated with autism. Most cases of autism appear to be associated with the appearance of new mutations that are not inherited from the child’s parents, researchers from the University of Washington School of Medicine report. These new mutations occur in regions of the genome that contain genes, which code for proteins, as well as in “non-coding” regions, which do not contain genes but which regulate gene activity, the researchers found. “We are excited by these early findings because they suggest that multiple new mutations in a child, both coding and non-coding, are important to understanding the genetics of the disease,” said Evan Eichler, UW professor of genome sciences, who led the team that conducted the study. 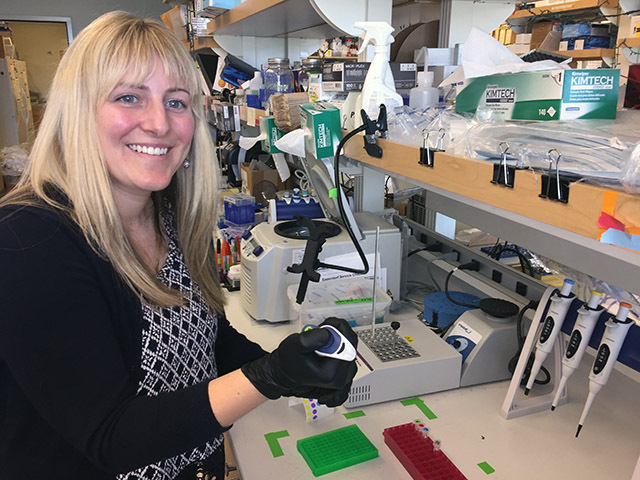 The first author of the study, which was published online in the journal Cell, was Tychele Turner, a postdoctoral fellow in the Eichler Lab. Although some forms of autism appear to run in families, most cases occur in families with no history of the disorder. This form of autism, called simplex autism, is thought to occur from new mutations that appear when the the parents’ sperm or eggs form. These new, or de novo, mutations are found in the affected child’s genome, but not in its parents’ genome. They are unlikely to occur in the affected child’s siblings. In the new study, researchers used a huge genomic database created by the Simons Foundation Autism Research Initiative. The scientists compared the genomes of 516 individuals who had simplex autism with the genomes of their parents and one sibling who was not affected by the disorder. Artist's conception of a DNA molecule. Image from the National Human Genome Research Institute. By comparing these family members, researchers hoped to identify new mutations that were more likely to appear in the affected child and more likely to be associated with an increased risk of developing autism. Most previous studies had limited such comparisons to the small portion of the genome that includes the instructions for the synthesis of proteins. This coding region contains genes. The new study compared almost the entire genomes of the study participants, including the regions that do not include genes. Although these “non-coding” regions do not include instructions for protein synthesis, they play an important role in regulating protein synthesis by turning genes on and off and dialing their activity up or down. The researchers found that mutations that tended to appear in non-coding regions of the genomes occurred in areas that are known to influence activity of genes in neurons located deep in the brain in a structure called the striatum. This part of the brain is thought to play a role in some of autism behaviors. The mutations were also found in areas of the genome that influence the genes involved in embryonic stem cell development and fetal brain development. The findings suggest that relatively few of the new mutations in genes linked to autism risk were needed to increase the odds of having the disorder. The risk rose with as few as two of these newly appearing mutations. Eichler said that, to nail down the role in increasing autism risk played by mutations in the regulatory, non-coding regions of the genome, it will be necessary to repeat the study with a much larger number of sets of parents and their children. The study’s collaborators included researchers from the New York Genome Center, Lawrence Berkeley National Laboratory, University of California, Davis, Rockefeller University, and the U.S. Department of Energy Joint Genome Institute. This work was supported by grants from the Simons Foundation Autism Research Initiative (SFARI 303241, 385035. ); National Institutes of Health (R01MH101221, UM1 HG008901, U24HG008956, R01HG003988, U54HG006997); Department of Energy Contract DE-AC02-05CH11231; and the Autism Science Foundation (#16-008). This news item was written by Michael McCarthy.